An iPhone wallet case is perhaps the most important accessory you can acquire for your mobile device. It doesn’t only help protect your phone from all hazardous collisions, it also bestows upon it an aesthetic beauty that can’t be matched by any other phone accessory. An iPhone wallet case is very pleasing to look at and usually possesses many slick features that aid its function. There are several varieties of iPhone 7 and 8 wallet cases available for you to purchase depending on your taste and style. No matter the design or theme you seek, you are certain to find an iPhone pouch that satisfies your incredible taste for creativity. 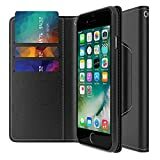 Choosing an iPhone wallet case can be a tasking process, especially if you do not have a specific case in mind when you want to purchase one. There are, however, certain factors you should consider when looking to purchase this important accessory. This guideline should see you through the exciting process of selecting an iPhone wallet case. 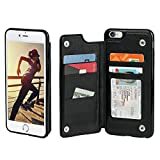 The most important feature you should look out for in an iPhone wallet case is its functionality, after all, the principal purpose for the acquisition of this helpful tool is to provide protection for a phone from external hazards like water, heat, and brute contact. Endeavour to confirm that the phone pouch you’re buying is able to sheath your iPhone because even the tiniest flaw in the phone case’s integrity can cause damage to your phone. It is important that the quality of the iPhone wallet case you’re buying is second to none. This ensures that the case is both durable and effective. 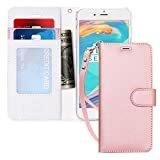 You do not want to purchase a phone pouch that ends up being faulty after only a few weeks; hence, it’s best that the quality of the iPhone wallet case you’re buying can be vouched for. The iPhone wallet case must blend perfectly with the phone being sheathed. 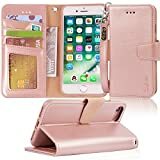 There should not be great disparity between the colour of phone and that of the wallet case, and its design should basically magnify the beauty of the phone itself. If you wish to purchase an iPhone 7 and 8 wallet case, then these 12 cases described below are certainly the best in 2019. This beautiful iPhone wallet is made from resilient leather that guarantees its longevity and durability. Its front cover is embossed with a sun pattern that further exposes its elegance and increases the visual appeal of the iPhone. Compatible with iPhone 7 and 8 phones. Extra slots for ID cards, credit cards and debit cards. Very thick and resilient cover that is able to protect the phone from wear. If you’re the type of user that loves slick wallet cases with glittering patterns, then the UrSpeedtekLive will certainly appeal to you. Its flowery design creates an aesthetic that dazzles at sight and its functionality is equally impressive. If what you’re looking for in an iPhone wallet case is futuristic innovation and slickness, then the Vofolen iPhone wallet case is the ideal accessory for you. Its build is one of a kind and its reliability is certain. With a sliding card holder that secures your valuable items and ID cards, you are guaranteed to enjoy the full benefits of the pouch. Tough cover that protects the phone from scratches. No other iPhone wallet case exhibits both professionalism and slickness with its build like the Maxboost Premium 7 wallet case. This aptly crafted security pouch isn’t only efficient in performance, it is also slick in design. With multiple colour options available, you are guaranteed to find a wallet case that blends perfectly with the aesthetic of phone. Aptly carved cut-outs for the ear-piece, camera, and ports. The ZVE iPhone wallet case is a compact accessory that is a perfect fit for the 4.7 inches iPhone 7 and 8 phones. Its appearance is both visually pleasing and aesthetically slick, and its numerous slots are capable of housing all types or cards, cash, and documents. Allows for easy access to the smartphone even when in use. Just like the name infers, this iPhone wallet case is a rugged accessory that is most suitable for iPhone users that engage in lots of activities. The entirety of the case is aptly covered to protect the phone within from damage due to direct contact and also hazardous weather conditions. This iPhone isn’t just lauded for its sleek design and beautiful appearance, it is also praised for being one of the few iPhone accessories in the market capable of blocking RFID signals that can be used to steal data from a user’s mobile. With this spectacular phone pouch you are guaranteed both quality and security at the same time. RFID blocking that protects the information on credit cards, Debit cards, and other storage gadgets. This iPhone wallet case is characteristically built to withstand the toughest of contacts from external sources. Though its design lacks the finesse of most conventional pouches, it perfectly suits the rugged trait it exhibits. With its military-styled cover, the safety and security of the iPhone can be guaranteed. 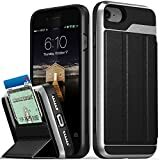 The aesthetic build of the iPhone wallet case is simply exceptional, and its design is perhaps among the best in the market today. Made from high quality denim material, this slick beauty is the idle iPhone wallet case for iPhone users that value style in any accessory they purchase. Multiple slots for ID cards, credit cards, and debit cards, and a spacious pocket that is able to accommodate receipts and pills. Compatible with both iPhone 7 and iPhone8 phones. The Spigen Slim Armor wallet case is indeed an innovative accomplishment in the field of phone pouches. It isn’t only its slick build that many find enticing but also its robust functionality that makes the accessory capable of withstanding hazardous conditions. A sliding cover that gives swift access to the components within. iPhone users usually tend to favour wallet cases that are slim and light because they do not drastically alter shape and appearance of the phone. The Silk iPhone 7 and 8 wallet case is perfect example of a wallet case with compact build and efficient functionality. It doesn’t enhance the security of your iPhone it also increases its visual appeal. Air pocket corners that protects the phone from sudden impact. Not many iPhone wallet cases are able to merge elegance in design and ruggedness in build, but the Arae PU Leather wallet case manages to do so impressively without any flaw in its feature. Reinforced with resilient leather across the entirety of its cover, the wallet case certainly deserves its crown as the best protection gear for iPhone 7 and iPhone 8 phones in 2019. A wallet case is an essential item to possess and it’s perhaps the first accessory that is purchased after acquiring a phone. 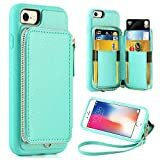 If you wish to purchase a wallet case that fits your style and protects your phone competently, then any of the cases listed above should suit you perfectly.